EXCLUSIVE | Public officers facing maladministration allegations would have the right to refuse to give evidence to an ICAC investigation under proposed Labor amendments to a contentious Bill designed to deliver greater transparency to South Australia’s anti-corruption watchdog. The state Opposition is set to introduce a raft of amendments that would take more power from the hands of Independent Commissioner Against Corruption Bruce Lander, including a thorough parliamentary audit of the Act governing his office’s operations by mid-next year. Amending the ICAC Act to allow public hearings for maladministration cases – at the discretion of the Commissioner – was a Liberal election pledge, but the legislation has proved problematic. A first draft of the Bill was stymied when Labor refused to back it unless it went before parliament’s Crime and Public Integrity Policy Committee for review. That review saw the Bill redrafted and reintroduced to parliament late last year, with new safeguards for people under investigation, including the right to appeal the process to the Supreme Court. But Lander has savaged the new Bill, telling Attorney-General Vickie Chapman in correspondence made public last November that the proposed amendments “give rise to a number of practical difficulties such that if the Commissioner were to order a public inquiry there would be a real risk that both the effectiveness of the investigation will be compromised and that the investigation would be beset by substantial delays”. In such circumstances, he wrote, “it would be expected that the Commissioner would rarely commit to holding a public inquiry”. “If the Bill was to pass in its present form the proposed power to conduct an investigation by way of a public inquiry… will, in practical terms, be largely devoid of utility and largely if not completely symbolic,” he wrote. But Labor is poised to further water down the original Bill with a host of new amendments, designed to apply “many of the same provisions that apply to a trial” to the public hearings. The proposed legislation states that “if allegations of potential misconduct or maladministration in public administration are made against a person and an investigation is to be conducted under this Act in relation to the matter” then that person “is entitled to refuse to participate in the investigation”. It’s part of a suite of changes designed to ensure “procedural fairness and rules of evidence apply to hearings”, which also include giving the subjects of inquiries the right to call or cross-examine witnesses and make submissions. They must also be formally informed if allegations of misconduct or maladministration have been made against them prior to appearing before the inquiry. Shadow Attorney-General Kyam Maher told InDaily Labor “supports the Bill that’s before parliament to allow open hearings of ICAC in certain circumstances” – despite Labor rejecting such a move in government. “We support that principle,” he says now. However, he said, “we want to make sure there’s fairness to people” called before such hearings. Maher said a public hearing “is a lot like a public trial”. “Over centuries things have been put in place to ensure people [on trial] are treated fairly… what we’re trying to do is look at those sorts of processes and procedures that apply to open court processes at a trial, and have some of them in this legislation,” he said. The amendments would also trigger a fresh review by the committee of the amended ICAC Act, including its impact on “the functions, operations and effectiveness of state law enforcement and integrity agencies”. The inquiry must report by July next year. Maher said he had “no specific concerns” about the Act’s effectiveness, but noted the committee had heard “evidence about interactions with other integrity agencies”. “If the legislation passes, we think it’s a good idea to have a look at how it’s operating [and] to have a look more generally at how the Act is working,” he said. The proposed changes are unlikely to win the support of Lander, who has already detailed his views on the recommendations of the committee, although he noted in his correspondence to Chapman that the matters relating to procedural fairness would have “no substantive effect on the operation of the Bill”. 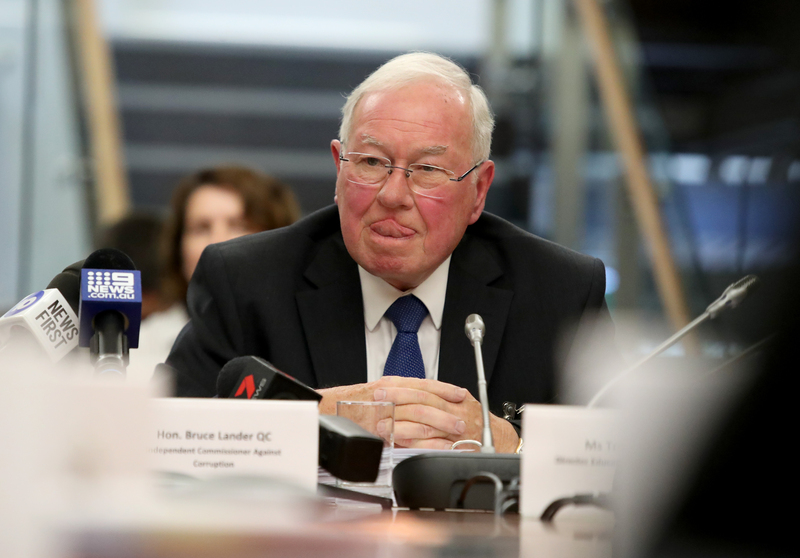 The ICAC ended the year mired in controversy, with Magistrate David McLeod considering whether to throw out a corruption case against a former Department of Transport bureaucrat, Michael William King, after Lander used a parliamentary hearing and a subsequent radio interview to question the court’s decision to rule warrants he had issued directly invalid.